William Paul identifes Herman Heinfetter as a pseudonym for Frederick Parker, a prosperous London businessman and writer. 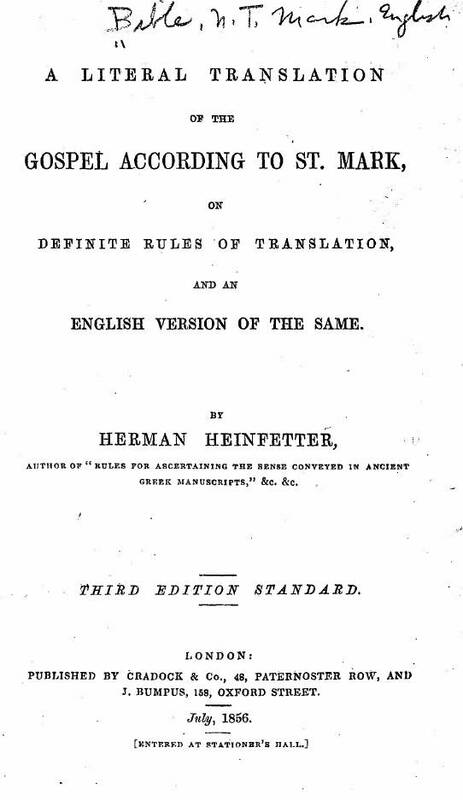 Click here for sample verses from the translation by Herman Heinfetter. 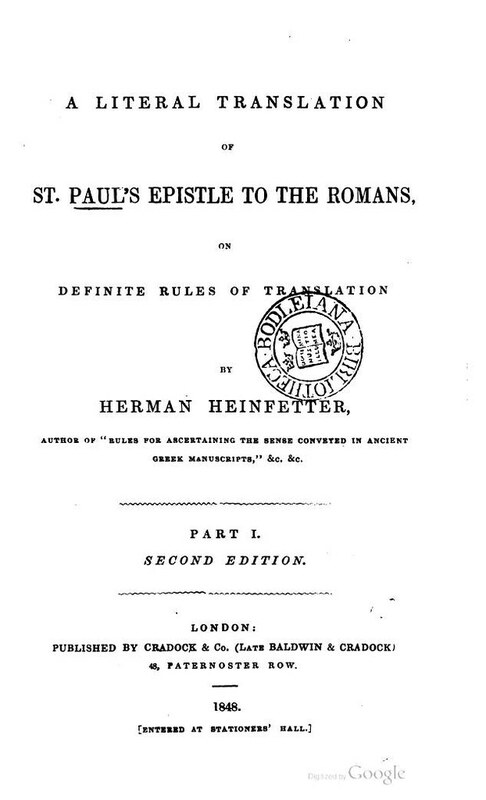 Title: A Literal Translation of St. Paul's Epistle to the Romans on Definite Rules of Translation by Herman Heinfetter, author of "Rules for Ascertaining the Sense Conveyed in Ancient Greek Manuscripts," &c. &c. Part I. Second Edition. 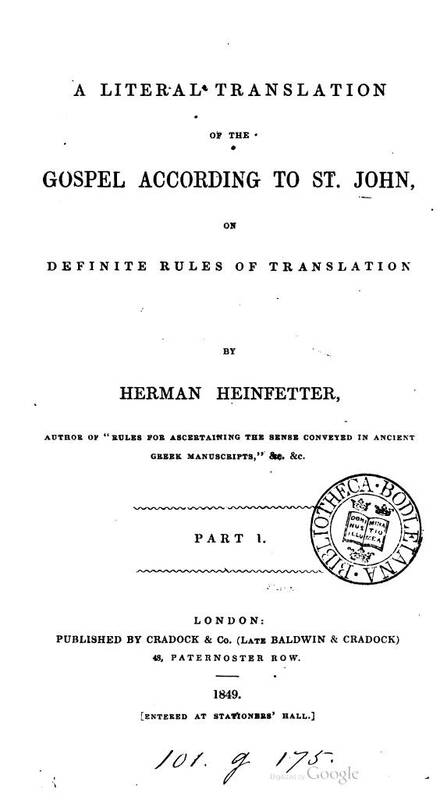 Title: A Literal Translation of the Gospel According to St. John on Definite Rules of Translation by Herman Heinfetter, author of "Rules for Ascertaining the Sense Conveyed in Ancient Greek Manuscripts," &c. &c. Part I. 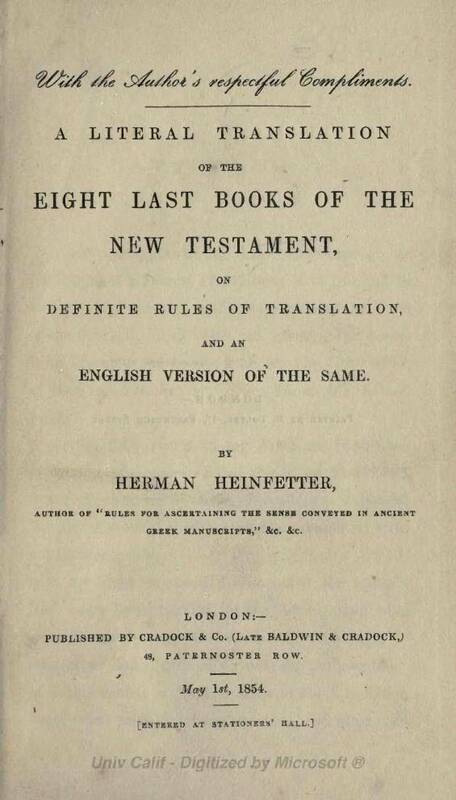 Title: A Literal Translation of the Eight Last Books of the New Testament, on Definite Rules of Translation by Herman Heinfetter, author of "Rules for Ascertaining the Sense Conveyed in Ancient Greek Manuscripts," &c. &c.
Title: A Literal Translation of the Gospel According to St. Matthew, on Definite Rules of Translation, and an English Version of the Same. 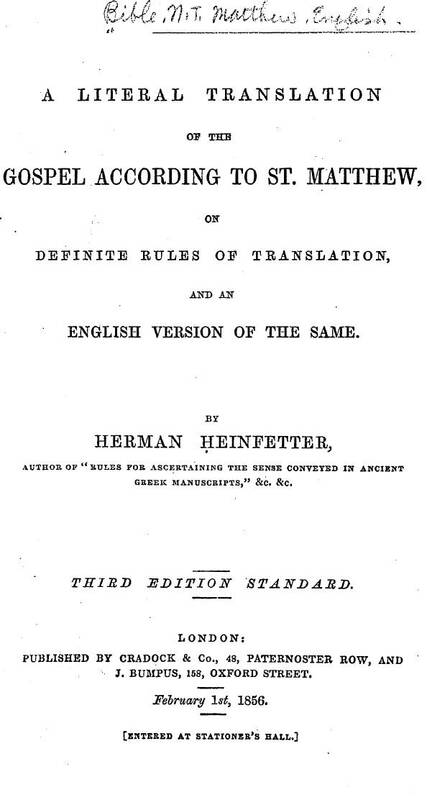 by Herman Heinfetter, author of "Rules for Ascertaining the Sense Conveyed in Ancient Greek Manuscripts," &c. &c. Third Edition Standard. 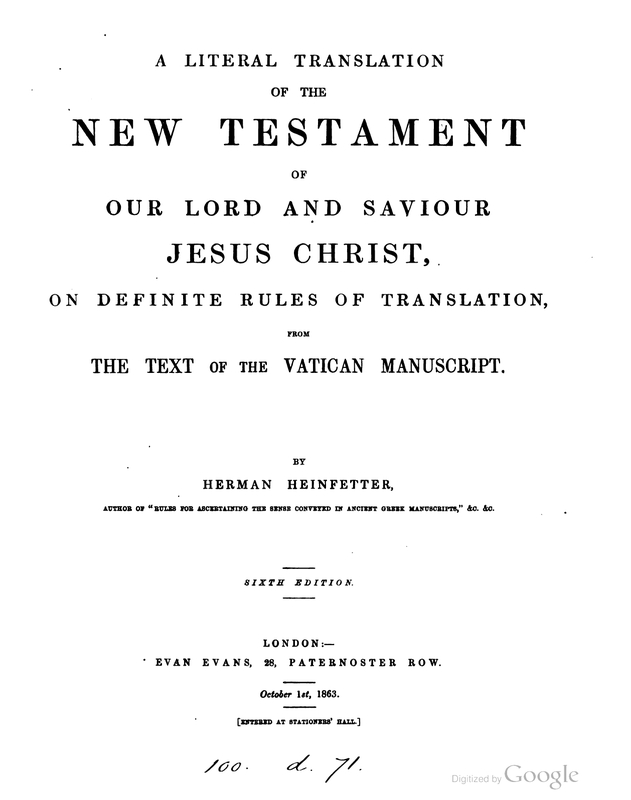 Title: A Literal Translation of the Gospel According to St. Mark, on Definite Rules of Translation, and an English Version of the Same. by Herman Heinfetter, author of "Rules for Ascertaining the Sense Conveyed in Ancient Greek Manuscripts," &c. &c. Third Edition Standard. 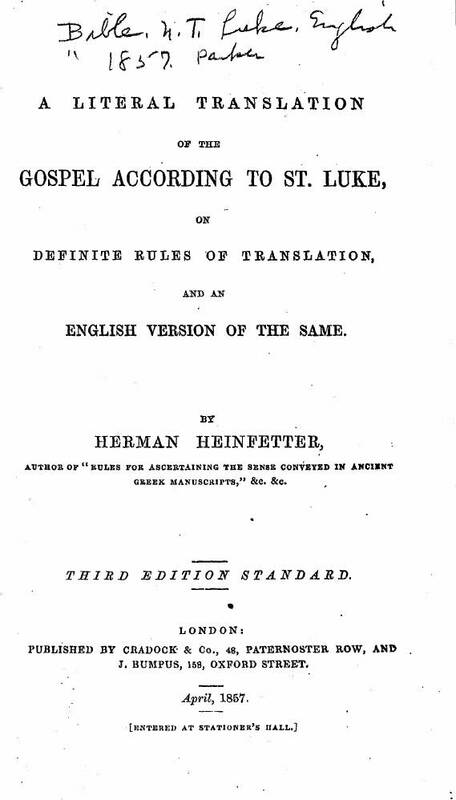 Title: A Literal Translation of the Gospel According to St. Luke, on Definite Rules of Translation, and an English Version of the Same. by Herman Heinfetter, author of "Rules for Ascertaining the Sense Conveyed in Ancient Greek Manuscripts," &c. &c. Third Edition Standard. 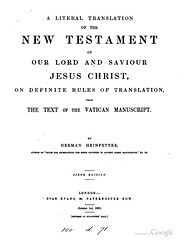 Title: A Literal Translation of the New Testament of Our Lord and Saviour Jesus Christ, on Definite Rules of Translation, from The Text of the Vatican Manuscript. by Herman Heinfetter, author of "Rules for Ascertaining the Sense Conveyed in Ancient Greek Manuscripts," &c. &c. Sixth Edition.